This modern unit is 35 sq.m and on located on 2nd floor. 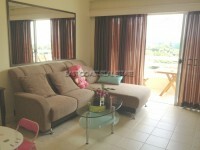 It comprises 1 bedroom, 1 bathroom, open plan living area with European style kitchen, washing machine, TV and refrigerator. Available under foreign ownership and for “SALE” only. This is a re-sale unit. Be the first to own this great apartment!